Prevents skin darkening and checks premature ageing. A double-action formulation that protects and nourishes, Himalaya Herbals Protective Sunscreen Lotion contains the SPF15 breakthrough herbal extract Cinnabloc®, giving long-lasting protection from harmful UVA and UVB rays and preventing skin darkening. Aloe Vera moisturizes the skin, while Apple extract prevents skin cell degeneration and premature skin ageing. 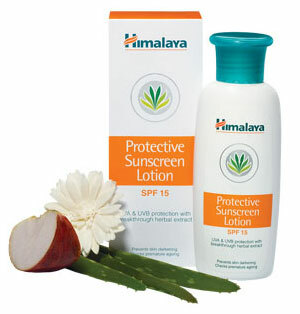 Apply Himalaya Herbals Protective Sunscreen Lotion liberally on exposed skin like face, neck and arms before going outdoors during the day. Avoid the area around the eyes. Please do not use on children below six months of age.